I was introduced to the joys of corespinning by Ruth when she brought a whole pile of her handspun yarn with her to Angelknits one night. I was totally fascinated by some corespun kid mohair she'd spun, and Ruth being Ruth, she told me how she'd done it. 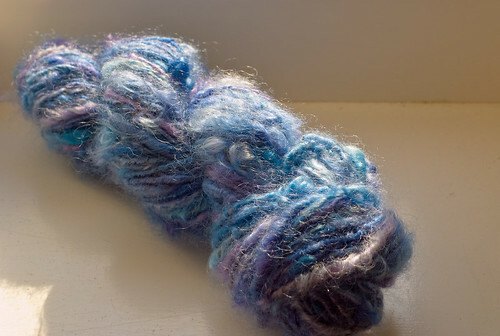 When I was at Ally Pally in October, I spotted some kid mohair that I thought would be perfect for giving it a go, and so after a bit of trial and error, I had a skein of corespun kid mohair. That skein isn't this skein. It went to Nikki as part of her birthday present. This skein has sat on the wheel since November, cruelly neglected while my life took an amazing turn for the better (and busier). Now it's off the wheel and a lot happier, and unfortunately, no photo can do the colour or softness justice. It's 70 yards of pure squishy heaven. The best bit is that I have enough fiber and yarn for a another skein of this.